Ronald McDonald House Charities of Central Illinois® is coming to Peoria! 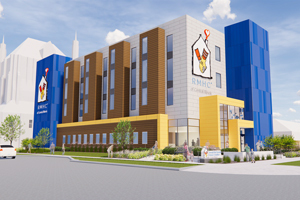 We are thrilled to more than double our impact with the addition of a Peoria Ronald McDonald House (RMH) in the heart of the Peoria medical district! The new Peoria RMH will serve families with children receiving care at any area medical facility, including OSF HealthCare Children’s Hospital of Illinois and UnityPoint Health. We broke ground in September 2018, with the grand opening tentatively scheduled for Fall 2019. What will the Peoria Ronald McDonald House look like? The planned Peoria RMH will be about 40,000 sq. ft and four stories. It will be located at the corner of Spalding Avenue and NE Monroe Street downtown. The first floor is reserved for community spaces. This includes a large central family/guest kitchen, a 50-person dining room, family room, toy store, game room, arts & crafts room and community room. There will also be a playground outside with a secure access point. Parking will be available in a lot we are in the process to purchase across the street off Spalding. How many families can stay at the Peoria Ronald McDonald House? The Peoria RMH will have a total of 22 mini-suites available when the doors open, which will be located on the second and third floors of the building. Each mini-suite sleeps up to five guests and includes a private bathroom. The fourth floor will be shelled-out for future expansion. Why is there so much community space planned? 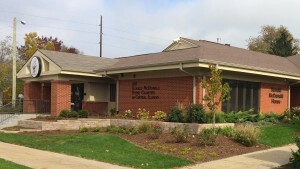 Community spaces are intentional at the Ronald McDonald House. That’s because in addition to giving families a place to stay, we want families to have a place to reset and recharge, so they can be the best advocate for their child that they can be. Many RMHC of Central Illinois families say the support they get from other RMHCCI families is invaluable in their journey. These community spaces give families a place to build friendships, celebrate victories and offer comfort to one another. Will there be an area dedicated to pediatric cancer patients? The second floor of the Peoria House will be home to the “The Dax Wing” and open to pediatric cancer patients. Fully sponsored by the DAX Foundation, the wing will include five mini-suites, a sitting area, laundry room and playroom that is separate from the rest of the facility to allow immunocompromised visitors a place of their own. The DAX Foundation was founded by Julie Locke to honor her son Dax, who passed away in 2009 from AML M7 leukemia. The foundation is donating and raising $1 million to build The Dax Wing at the Peoria House. Who is involved in the Peoria House build? A 25-person committee of Peoria area residents has been meeting for the past year to bring the new House to Peoria. The committee is Co-Chaired by Terry Clark, local McDonald’s Owner/Operator, and Julie Locke, Founder of the DAX Foundation. The Honorary Chair is Gordon Honegger, Chairman Emeritus of Morton Community Bank. Design and construction partners include Farnsworth Group and River City Construction. What is the total cost of the Peoria House Build? We are in the midst of a nearly $8M Capital Campaign to raise money for the Peoria RMH. As of September 2018, generous donors have helped us raise 80% of the needed funds. Now, we need your help to raise an additional $1.5 Million. Everyone can help, even if you are only able to donate a dollar or an hour of your time. BE ONE donation in the $1.5 million needed to complete the Peoria House and support RMHC of Central Illinois in any way you can. In addition, ongoing funds for annual House operations will be needed, at an estimated $1 million each year. Can I make a corporate donation or a donation in honor of someone? Through the Adopt-the-House Program, donations may be given to honor, recognize or memorialize individuals, families and businesses or to commemorate special occasions. Specific room donations range from $25,000 to $100,000 and will include a special plaque outside the room to recognize your donation. Donations can be made online at rmhc-centralillinois.org/donate, or you may mail it to P.O. Box 5354, Peoria, IL 61601-5354. Donations at $1,000 and above will be recognized on a donor wall planned at the entry of the Peoria RMH. For more information about sponsorship opportunities or the Adopt-the-Room Program, contact CEO Kelly Thompson at kt@rmhc-centralillinois.org or at (309) 401-2525.